The men's Patriot military ring is made of premium silver and is our largest ring style. The Patriot ring is 22mm across the widest part on top; 30mm from top of stone to bottom of ring shank. Import. 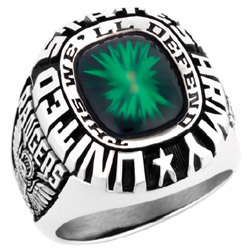 This solid back Balfour military ring is made of Premium Silver. Premium Silver is harder than other tarnish-resistant silver metals and more precious than Sterling Silver. It has a brilliant white luster familiar to sterling silver buyers with added strength from platinum. It is 95% silver, and 5% copper and platinum alloy. Choose a side emblem from the menu above. Customize your side emblem with an engraving. First, choose an option above. YY-YY (ex. 79-99) Do not include apostrophes. Choose a side emblem representing your branch of service above. Complete it by entering your first name below. I wear the ring when I go out with my friends. I have some very nice comments about the ring already. I'm disappointed that the wording is not as I expected it to be. The phrase "United States Army - Retired" is different from "United Sates Army Retired". This takes away from the looks of the ring. If I had seen this before i ordered it, I would have thought twice.